New York-based Committee to Project Journalists (CPJ) on Thursday urged the government of Maldives to free three journalists arrested from opposition protests last week. “We call on the authorities to immediately release Mohamed Wisam, Adam Zareer, and Mohamed Niyaz, and allow journalists in the Maldives to do their jobs freely and safely,” CPJ Asia Program Coordinator Bob Dietz said. Opposition-aligned Raajje TV’s Wisam and Zareer were arrested late on Wednesday evening while covering the Alliance Against Brutality’s nightly protest. They were subsequently placed under a five-day remand. Channel One’s cameraman Niyaz was arrested on Tuesday. He was remanded for ten days. “By holding these journalists without charge for days at a time, authorities in the Maldives are clearly trying to suppress news coverage of events through silencing and intimidation,” Dietz said. Raajje TV head quarters were torched and destroyed in an arson attack in October 2013. Its former journalist Asward Ibrahim Waheed was nearly beaten to death in February 2013. No one has been held accountable for the attacks. According to the President of the Maldives Broadcasting Commission (MBC) Mohamed Shaheeb, the Commissioner of Police Hussein Waheed in a phone call on Thursday pledged to expedite investigations and free the three journalists as soon as possible. Speaking to Haveeru, Shaheeb urged journalists to act professionally in covering protests, claiming some act like opposition activists at gatherings, pushing back against riot police shields and aiming their cameras inches away from police officers’ faces. 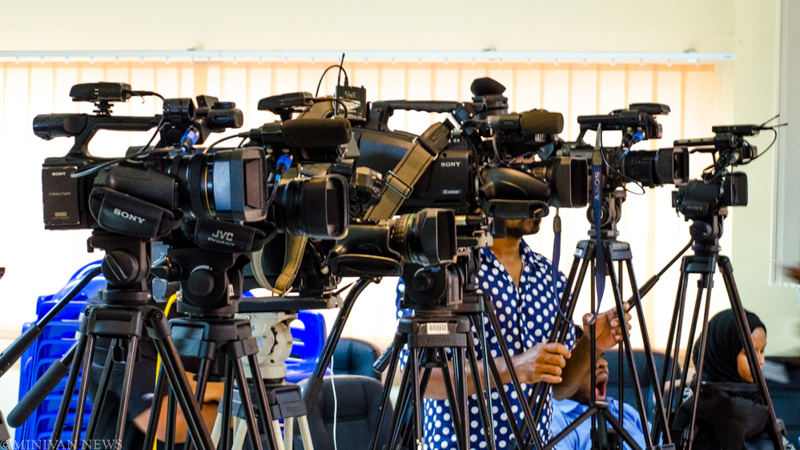 “The Maldives Police Services facilitates the opportunity for journalists to cover protests. So I urge journalists to be more professional than they are now. If journalists acted within their bounds, it would be easier for us to advocate on their behalf when they get arrested from protests. Even so, we are working on these cases,” he said. This year, the Maldives fell to 112th place in the Reporters Without Borders (RSF) Press Freedom Index, marking a decline for the fourth consecutive year. In April 2014, President Abdulla Yameen vowed that his administration would not take action against the media “no matter how far journalists take the freedom offered by this government”. In May 2014, the MBC released a landmark ‘Threat Analysis Report‘ which found 84 percent of journalists surveyed reported being threatened at least once, while five percent reported being threatened on a daily basis. Journalists identified political parties to be the top source of threat. Gangs, religious extremists and parliament placed second while the government was rated third.